Sanborn Maps are an incredible resource for community history, and especially for fire departments. They were originally created for use in considering fire insurance liability in roughly 12,000 US towns and cities from 1867 to 2007. Mapping for fire insurance purposes had been done for a century prior to the Sanborn Company, first beginning in London in the late 1700's. Following the end of the Civil War, fire insurance mapping expanded rapidly, pacing the growth in America, the rebuilding of the South and the massive growth in the west. Mapping needs were driven by events such as the Homestead Act, The Industrial Revolution, railroad expansion, and tremendous immigration, all of which led to steep population growth. The Sanborn Company began making fire insurance maps in 1867 for fire insurance considerations in America, and eventually became the largest and most successful American map company. They were headquartered in New York, but had regional offices in Chicago, San Francisco, and Atlanta. They sent out surveyors to record building footprints and details in all major urbanized areas as related to their fire liability. It was because of these details and the accuracy of the Sanborn maps, coupled with the Sanborn Company’s standardized symbolization and aesthetic appeal that made the Sanborn Company so successful and their maps so widely utilized. The maps were originally created solely for insurance assessment purposes. Insurance companies used the maps to assess the liability of any particular building by showing the information included on the map - building material, location to other buildings, any fire protection including fire departments, fire water supply, location of gas lines, etc. Decisions related to offering insurance, if at all, and at what price, were often determined solely through the use of a Sanborn map. In Marin County, we know of the existence of maps preserved through the Library of Congress in the following communities: Bolinas (1928-1931); Corte Madera (1909, 1924); Fairfax (1919, 1924, 1943); Larkspur (1909, 1924, 1942); Mill Valley (1903, 1908, 1924, 1948); Novato (1911, 1924, 1943); Point Reyes (1928); Ross (1919, 1942); San Anselmo (1909, 1919, 1924, 1950); Sausalito (1887, 1891, 1894, 1901, 1909, 1919, 1945); San Rafael (1887, 1894, 1924, 1950); and Tiburon (1891, 1900, 1911, 1928). There may be others that have original maps, but this is unknown to our group. We will eventually post the maps when we receive copies, and as an example below please find a Larkspur map with a blowup of the top stamped section that describes the FD and water system. This is a blowup of the top portion of the map from 1909 for Larkspur. 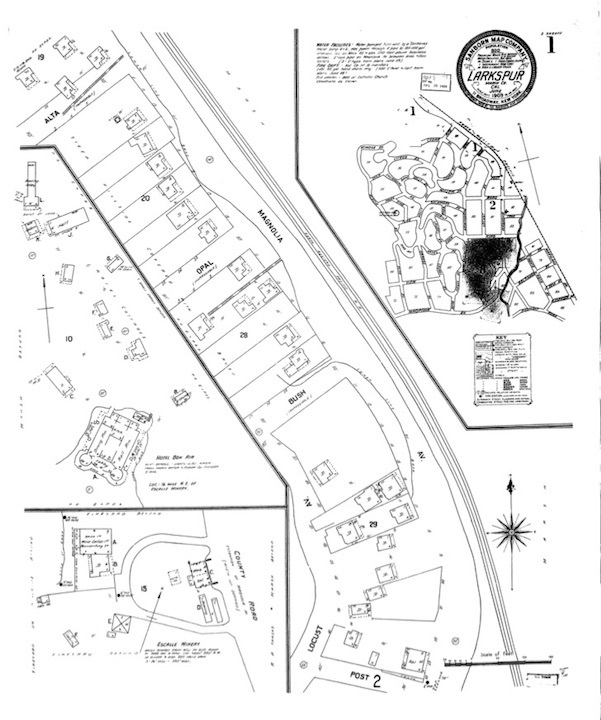 The stamped area shows the population and briefly describes the FD and water system. The full page map sample, page 1 for Larkspur in 1909.